In a show of solidarity with his Democratic colleagues who are staging a sit-in, Dr. Ami Bera (D - Elk Grove) made a floor speech today demanding action on gun legislation following last weeks Orlando shooting that left 49 people dead. (See video below). 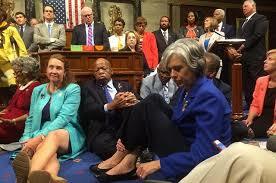 At the center of the Democratic caucus' sit-in is a demand that Republican Speaker of the House Paul Ryan allow a vote on proposed legislation that would ban individuals listed on the Homeland Security's so-called no fly list from purchasing firearms. Led by Congressman and civil rights icon John Lewis, Democrats are threatening to occupy the floor until a vote is permitted. Even if Ryan were persuaded to allow a vote, which he has vowed not to do, it is unlikely to pass the Republican led House. Nonetheless, given that polls indicate growing frustration with Congressional inaction on the issue, Democrats promise to press on. The issue has not surprisingly seeped into the hotly contest race between Bera and his Republican challenger, Sacramento County Sheriff Scott Jones. To that end, a protest against Jones, who has expressed concerns with the no fly legislation on due-process grounds, is being organized for this afternoon stating at 3:15 at the Sacramento County Administration Building, 800 H Street, Sacramento.